MK Dons boss Robbie Neilson is desperate to round off November with a victory on Saturday, but has branded hosts Doncaster Rovers as beimg ‘very, very dangerous’ opponents at the Keepmoat Stadium. Dons travel to south Yorkshire in good heart and aiming to stay on the fringes of the Sky Bet League One play-off picture. Neilson’s men are currently on a five-match unbeaten run, and in the past week have produced fighting performances to come from behind to draw at Charlton Athletic last weekend, and then at home to Southend on Tuesday. Doncaster go into the game off the back of a 3-0 defeat at high-flying Wigan on Tuesday night, but Neilson knows they are a different proposition when they are on home soil. 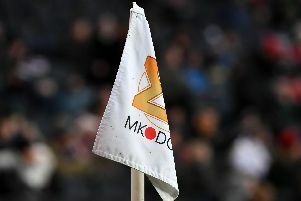 “Doncaster are very, very dangerous at home,” said the MK Dons boss. “They play a kind of 3-5-2 or 3-4-3 formation,and it is a different system from most teams and is interesting to watch, the way they pass the ball about and try to move it into the two number 10s. And he added: “We have had a decent run, although we would have liked to have picked up more points. “But to go five matches unbeaten is good, especially in this league, and on top of the form we had the previous month as well. Dons will travel boosted by the return to the fold of key players Ed Upson, Ethan Ebanks-Landell and George Williams, with all three missing the Southend clash after picking up their fifth bookings of the season in last weekend’s 2-2 draw at Charlton. And Neilson admitted: “They are three key players. “Upson, Williams and Landell are three players who have played a lot of football for us this year, so it is great to get them back in. “You want all of your players to be involved and you want them to be available, but it is that time of the season, just before the suspensions cut-off point, and they were unfortunate enough that they picked up their final booking.